24 1/4 by 18 3/4 in. 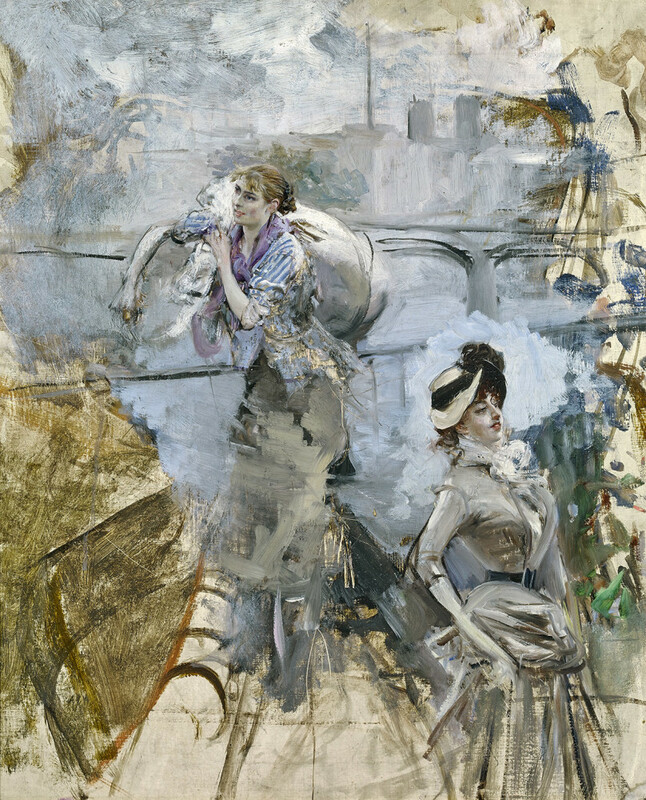 Boldini is concerned with developing a stylistic vocabulary that might convey the vigorous and spectacular effects of speed, steam, clamor, and anonymity in the modern city. In the 1870s and after a period of experimentation with historical subjects, suburban landscapes, and costume pieces, Giovanni Boldini applied himself to the challenge of depicting the “febrile movement of the streets” of Paris. This painting, Paris Types: A Study of Two Women, completed around 1878, offers an exceptional glimpse into Boldini’s burgeoning stylistic concerns, influences, and artistic range. 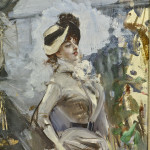 Though his fame has long rested on shimmering, virtuoso portraits of Parisian social elites from the late 1880s and 1890s—a reputation that has somewhat overshadowed the complexity and breadth of his oeuvre—this painting significantly nuances the view of Boldini as simply a rather superficial commercial portraitist. In fact, this early work reveals the developments of his dazzling painterly technique to be grounded in an attempt to convey the vitality of the modern city. Having moved from his native Italy in 1871, Boldini rapidly became enamored of the French capital—its new boulevards, cafés, parks, and suburban pleasure grounds as well as their typical representatives. He set up a studio in 1872 at Place Pigalle, in the artistic milieu of Montmartre, and over the course of the decade would undertake ambitious street-level representations of the city, often painting crowded intersections, a passing scene in a café, the speed of hurried horses, or the flickering effects of artificial lighting. 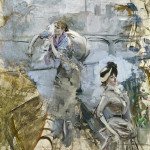 Though he never exhibited with his Impressionist contemporaries, Boldini shared with them an interest that extended from Charles Baudelaire’s 1863 call for a “painting of modern life” and in so doing attempted to represent the modern city’s most paradigmatic representatives. This composition presents two of modern Paris’ most recognizable female types—the laundress and the fashionably-dressed Parisienne. Its subject may recall the work of his friend and contemporary Edgar Degas, who in the mid-1870s became preoccupied with representing the laundress and, in so doing, the anonymous underbelly of new forms of urban labor. Unlike many Impressionist scenes of modern life however, Boldini’s painting represents the city as an energetic setting for vignettes and characters rather than a source of anxiety or marginality. 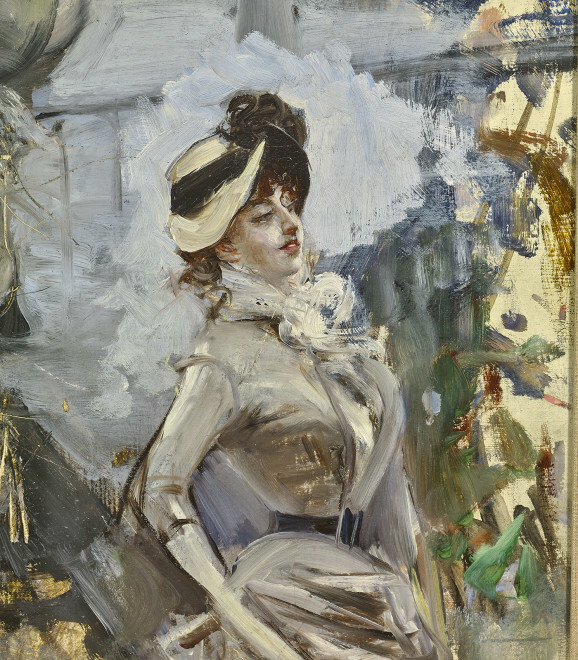 As represented in this work, likely a study for a larger painting, Boldini is concerned with developing a stylistic vocabulary that might convey the vigorous and spectacular effects of speed, steam, clamor, and anonymity in the modern city. 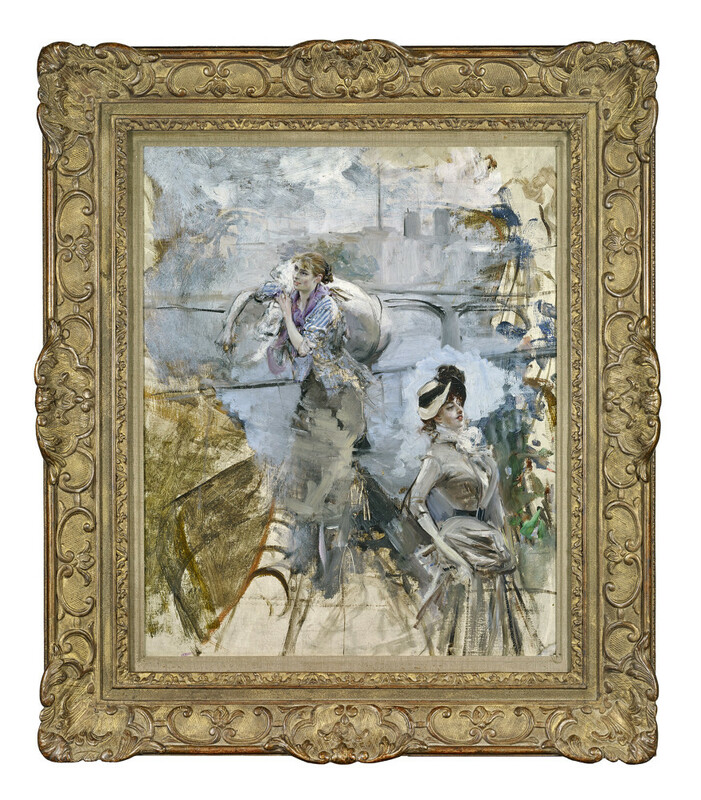 The characteristics of this technique included Boldini’s use of loose, undefined forms that one contemporary critic referred to as nothing less than “marvelous prestidigitation (applied) to modern subjects,” and another described as “a bit nonchalant and glittering.” The dissociated arrangement of the two figures here combines with the various fragments of urban infrastructure—bridges, buildings, and rail lines— in a variegated flurry of painterly facture that radiates outward. This serves to distinguish the female figures from one another while also conveying the sense that these female types are inseparable from, and perhaps even dissolving into, the haze of steam and speed on the streets. 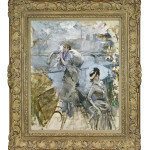 Indeed, in this attempt to represent modern life, we see Boldini developing his signature expressive, rapid brushwork that he would go on to hone in his later work. This has led to a recent, revised scholarly interpretation of the portraits of the 1880s and 1890s, and Boldini’s work as a whole, as an attempt to formally express the vividly-dizzying effects of modernity in the later nineteenth century. Baignères, 1879; J.-K. Huysmans, “Le Salon de 1879” (1883), 50.